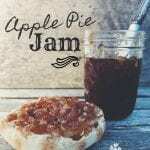 This Apple Pie Jam is perfect for using apples when they are in season. It also makes a wonderful gift. Prepare canner, jars and lids: Fill your canner (or pot with a canning rack in the bottom) with water. Wash jars and bands in hot soapy water and heat in a boiling water bath canner to sterilize. Keep jars warm in the water until ready to fill. Have new canning lids ready to be placed on jars. Peel, core and chop your apples. I like to peel all of my apples first, then core them all at once and then dice them up fine with my slap-chop, but you can dice them by hand with a knife or in a food processor. Measure out 4 cups of diced apples. As you measure them out, fill the measuring cup (with diced apples in it) with water so that the water just covers the apples. Do this all at once in a 4-cup measuring cup or repeat as necessary if using a smaller measuring cup. Dump apples and water into a large, stainless steel pot and add lemon juice, spices and butter. Bring mixture to a full rolling boil, stirring frequently. Then, reduce the heat to medium and boil gently for roughly 8-10 minutes until apples soften. Remove from heat and add pectin. Stir until dissolved. Place pot back on high heat and return to a boil, stirring frequently. Add both sugars at once and return to a full rolling boil that cannot be stirred down. Boil hard, stirring constantly, for one minute. Ladle into hot jars, leaving ¼ inch headspace. Remove any air bubbles by skimming around the edges of the jar with a knife and adjust headspace if needed. Wipe rims of jars with a clean cloth, place lids on jars and screw on bands until fingertip-tight. Place jars in canner, ensuring they are completely submerged and bring water to a boil. Once water is boiling, process for 10 minutes, then remove canner lid, wait 5 minutes and remove jars. Allow to cool at room temperature and try not to disturb the jars for roughly 12 hours. Store in a cool dark place to maximize shelf life.